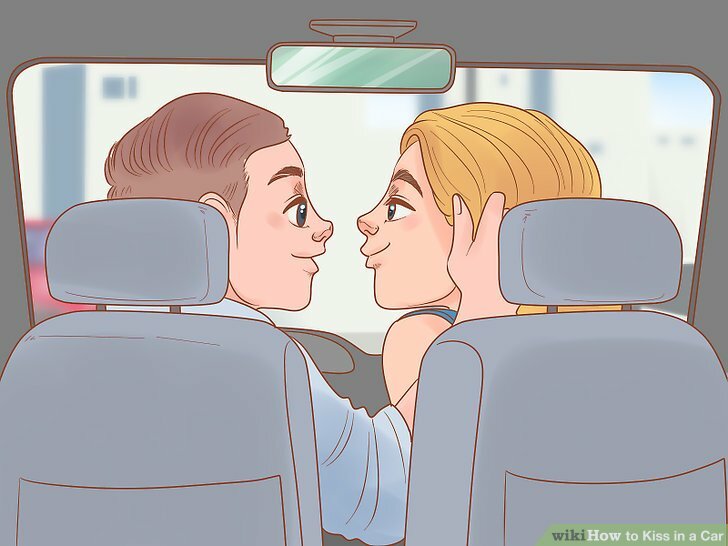 Whether you’re hoping for a first kiss after a fun date or are trying to find a private make-out spot away from parents or roommates, a car can be an ideal place for smooching. Flirt with your partner to build anticipation for a first kiss, or find a more secluded spot and rearrange your car seats for a more intense make-out session. Don’t forget to make sure your car is clean and inviting before you go in for the kiss. Get rid of any trash or eyesores and put on some fun music to create a comfortable, relaxed atmosphere. Flirt with your partner to see if they’re on the same page as you. Start by joking around or gently flirting with your partner, in order to build the mood. Hinting at your interest in them gives them a chance to respond in kind if they reciprocate your feelings, and helps you gauge their interest in kissing you. 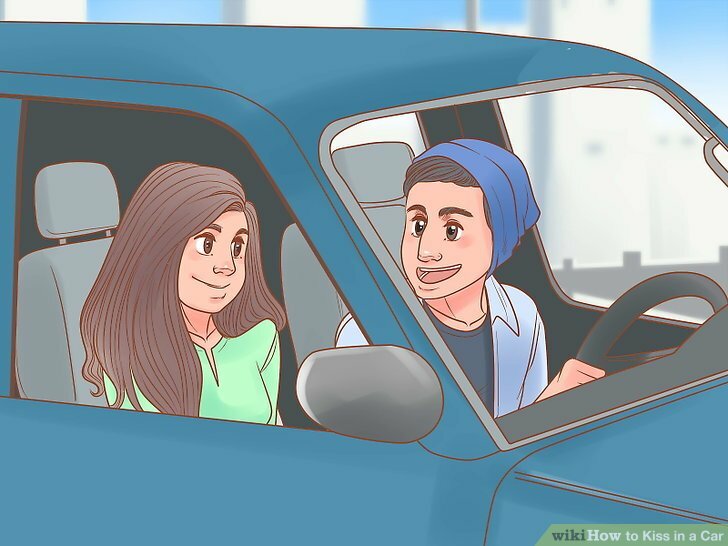 Make eye contact with your partner whenever the car comes to a stop, and once you park turn your whole body towards them to show you’re listening and interested. Ask your partner questions. Everyone likes to talk about themselves, and trying to learn more about your partner’s life, hobbies, or thoughts signals that you’re interested. Try telling your partner something positive about themselves or about the time you just shared together, such as "I really had a good time with you tonight, and I'd be interested in hanging out with you again!" If they respond positively and echo your feelings - for example, if they tell you that they want to meet up again - this may be a good sign that they’re on the same page. Look for positive body language. If your partner seems relaxed, is leaning towards you, and is making eye contact, this might be a sign that they’re interested. Watch for negative signals as well, such as your partner crossing their arms, fidgeting, or checking the clock. If you notice these signs, don’t pursue a kiss — it’s probably best to wait for a better time or place, or to accept that they’re just not interested in you. See if your date is facing you with an open and relaxed posture. This can be a good sign that they feel comfortable with you. Touch your partner’s arm or hand in a light, playful way. Initiating physical touch with your partner helps remove barriers between the two of you, allows you to gauge their interest, and may help both of you feel more comfortable. Keep things non-***ual to make sure your touch is not coming across as creepy and unwelcome. 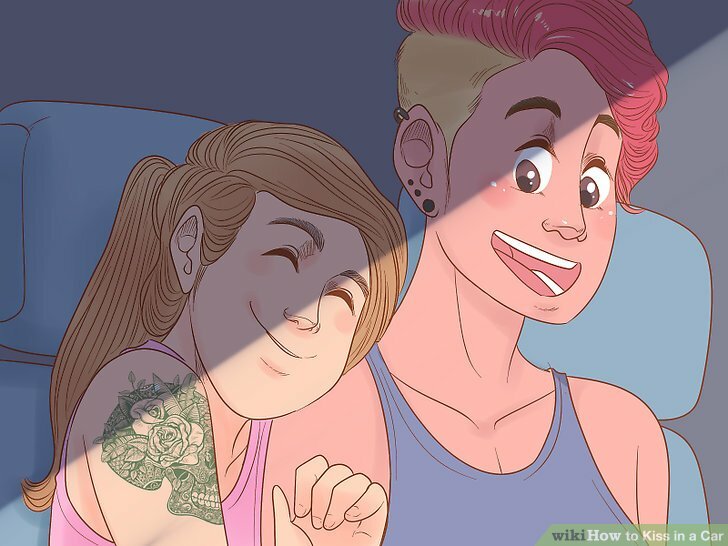 Examples of light, non-***ual touch include tapping your partner on the shoulder to get their attention, touching their arm while you’re talking to them, or placing your hand right next to theirs. Touching your partner anywhere else might be seen as more ***ual, and could make them uncomfortable. Don’t try to kiss someone out of the blue, with no warning — you should try to build towards the moment gradually. Ask for a kiss using body language. Signal your intentions by escalating your touch, such as putting your arm around their shoulder or giving them a hug, followed by a kiss on the cheek or forehead. If this is well reciprocated, you can try giving your partner a kiss on the lips. If you aren’t getting verbal consent from your partner, you need to be extra cautious that you’re reading your partner’s body language correctly — signs that your partner wants to continue include smiling, leaning towards you, and touching you back in the same way you’re touching them. If your partner says no or appears uninterested, respect their wishes. Pushing too hard or too fast might make your partner uncomfortable, might make you seem creepy, and may ruin any chance you have with them. Lean in for a kiss. Face your partner, pucker your mouth a little and plant a kiss on your partner’s lips. Don’t open your mouth until after your lips are already touching! Rest one hand on your lap or to the side and gently touch your partner on their cheek or hair with the other. Check that your partner is comfortable with what you have in mind. The easiest way to see if your partner is on the same page is to ask first! 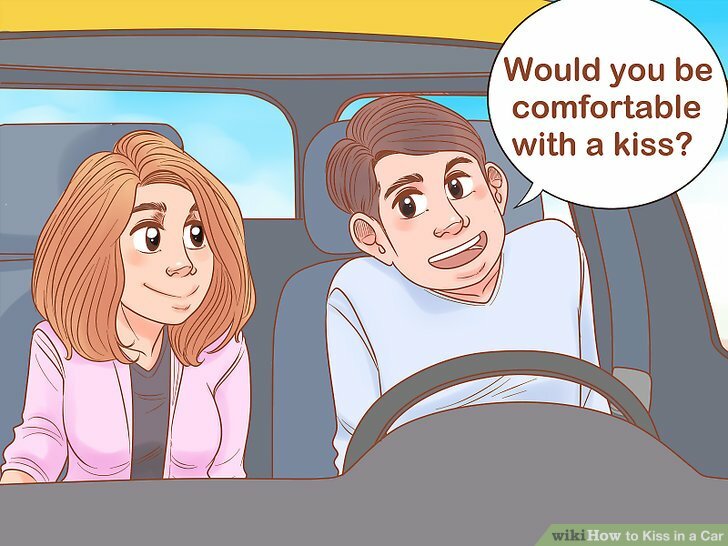 You need to check both that your partner is interested in getting more physical with you, and that they're comfortable with doing so in a car in a potentially more hidden area. You should definitely have had some sort of basic physical contact, such as light kissing or hand-holding, before initiating a make-out session. You can see how your partner feels about getting more physical by saying something like, "I would love to find a more private place to kiss you. Would you like that?" Tell your partner where you're planning on taking them before you drive to a more remote area. 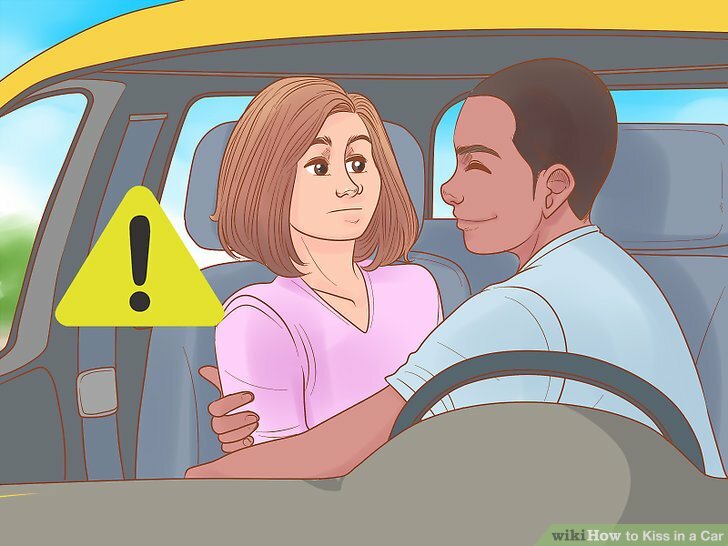 It may be tempting to keep it a surprise in order to make it feel more romantic, but you may end up ****ing the mood instead, as some people may be worried for their safety if you unexpectedly drive to an area where no one else can see you. Make sure you’re parked in a secluded area. 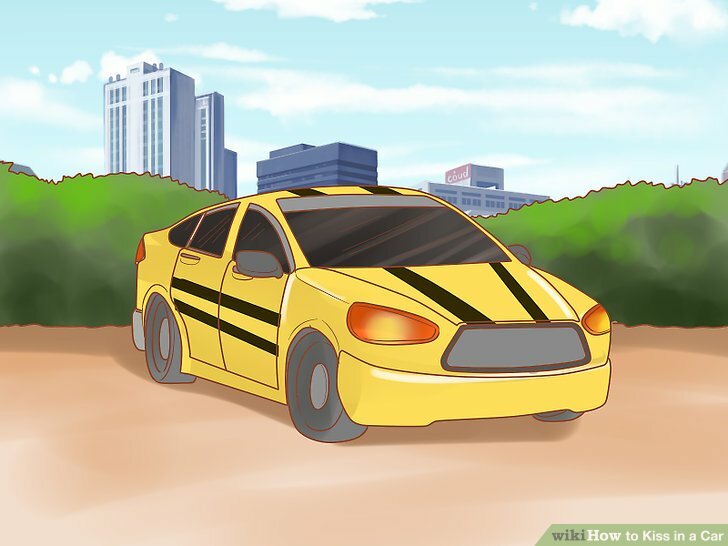 If it's dark outside, turn your headlights off to make you and your partner less noticeable. Double-check that both your partner as well as anyone else who may see you will not feel uncomfortable. Some people don’t like public displays of affection, and your partner may not want to kiss you where other people could see. Kissing in public is not against the law in most places, but if you want to escalate things beyond kissing, you may need to move to a more private spot indoors. If an act is illegal in public, then it’s illegal to do in a car that’s parked in a public spot. Build up the mood by flirting with your partner. Try giving them compliments, like "you look so cute right now!" Keep the mood light and don't try to push things forward too quickly. Initiate light physical touch, such as putting your hand on your partner's knee, if your partner is clearly engaged in the conversation and is reciprocating your touches. Try to build towards a moment where you are locking eyes with your partner, as this is usually when a kiss happens. But be careful not to stare intensely at your partner, as this can be seen as creepy! Initiate light kissing, and build from there. Wait for a moment where your partner is looking into your eyes, and lean over and kiss them on the lips. 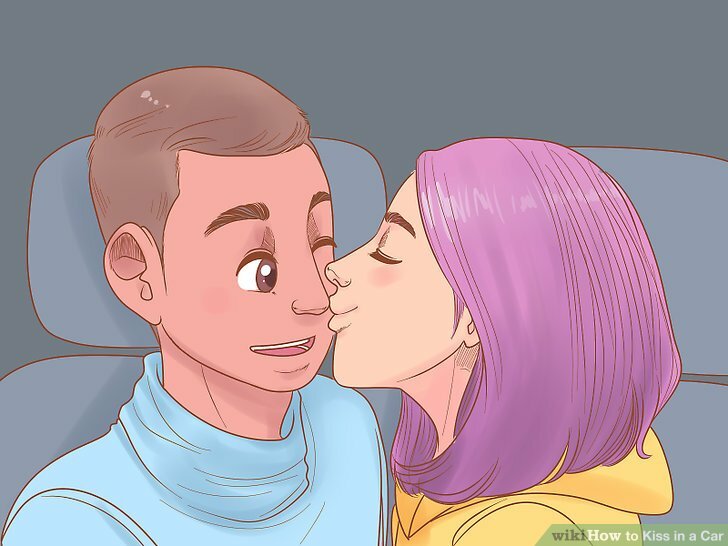 Start slowly, by keeping the kiss light, touching safe areas like their face or shoulder, and changing positions slowly. 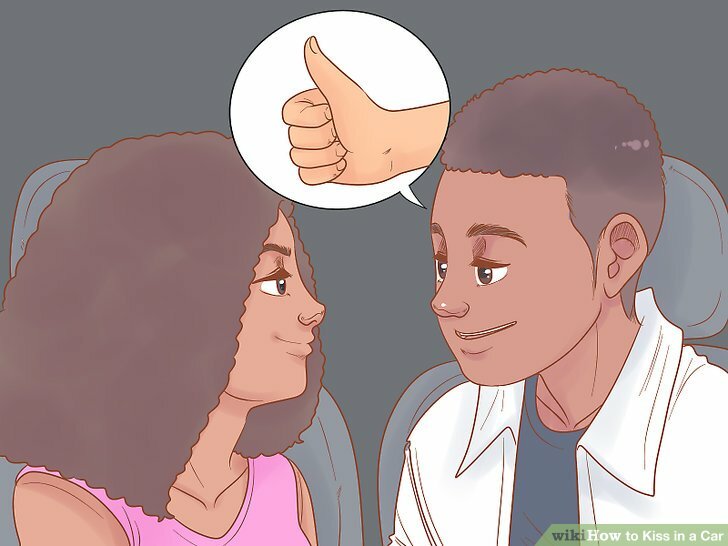 Build the kiss gradually by slowly escalating your touches and only proceeding if your partner is enthusiastically responding. Keep the kiss interesting by occasionally breaking apart to look into your partner's eyes or ask them if they like what you're doing. Every once in a while, move your hands to a new location, such as their hair, neck, hands, or leg. Adjust your car seats if the kiss continues to escalate. 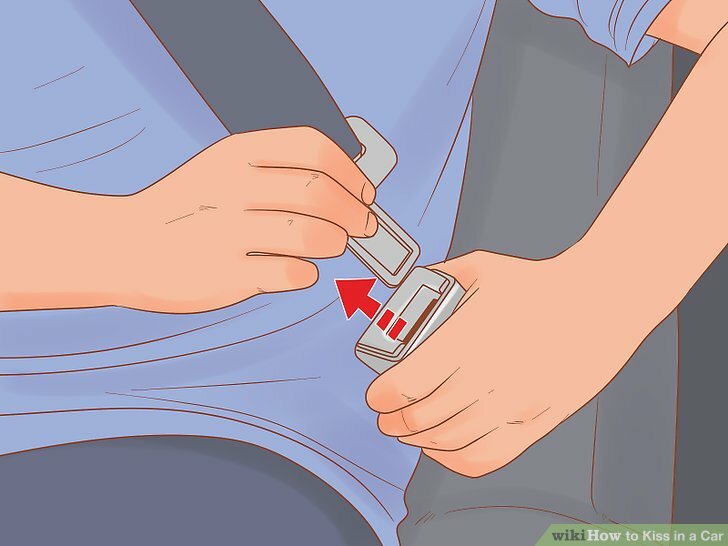 You may need to ask your partner to hold on for a second, and make some minor adjustments or ask them if they're interested in moving to the back seat. Slide your seats backwards and tilt the seats back if you’re in the front seat. If you’re in a vehicle with a bench seat, you may be able to just tilt the seats back and then lie down across the seat. 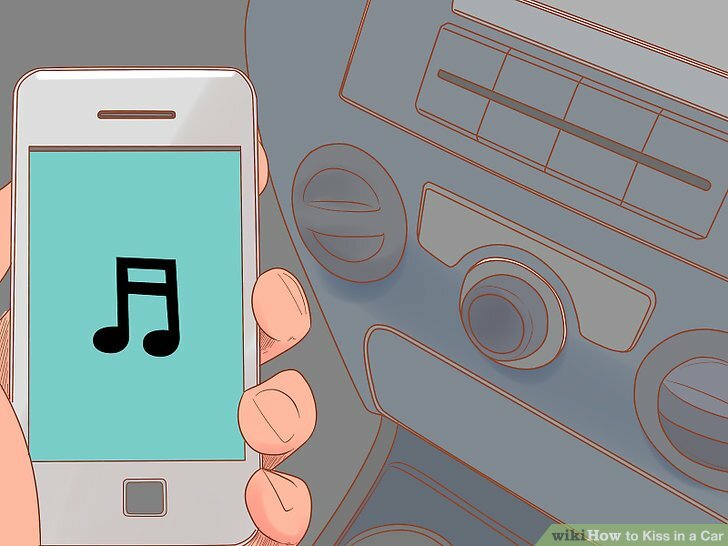 If there is a gearshift in between the two front seats, and you don't want to lean over it, it may help for both of you to move over to the passenger seat, where there’s no steering wheel or pedals to get in the way. Move the front seats forward if you’re going to hop in the back of the car. Try to make as much room as possible for you and your partner by sliding the seats up and flattening the backseat down into the trunk, if possible. Check in with your partner frequently to make sure they’re feeling comfortable. It can be hard to get physically comfortable when making out in a car, and you may have to adjust frequently. Furthermore, you should make sure your partner is feeling good about how far and how fast things are progressing. Get verbal consent by telling your partner what you want to do before you do it. For example, as you're kissing, tell your partner something like, "I'm going to slide my hand under your shirt," and wait for them to tell you yes or give you a non-verbal sign, like kissing you more enthusiastically. Pay attention to your partner's body language. Anytime you escalate your physical touch, read your partner's reaction. If they lean in closer, or touch you back in the same way, that's a good sign that they like what you are doing. If your partner moves backwards, stops what they're doing, or doesn't give you much of a response back, then pull back, as these are all physical ways of giving someone a "no." Get rid of any smelly, dirty, or unpleasant-looking mood ****ers. Make sure the seats where you and your partner will be sitting are clean and clutter-free. Remove food wrappers, trash, worn clothes, or anything else that might smell bad. Run a vacuum over the seats if they’re dirty. Most car washes and some gas stations have vacuum cleaners you can use on your car. If you’re worried about smells, hang up an air freshener or spritz some odor-eliminating spray in your car. 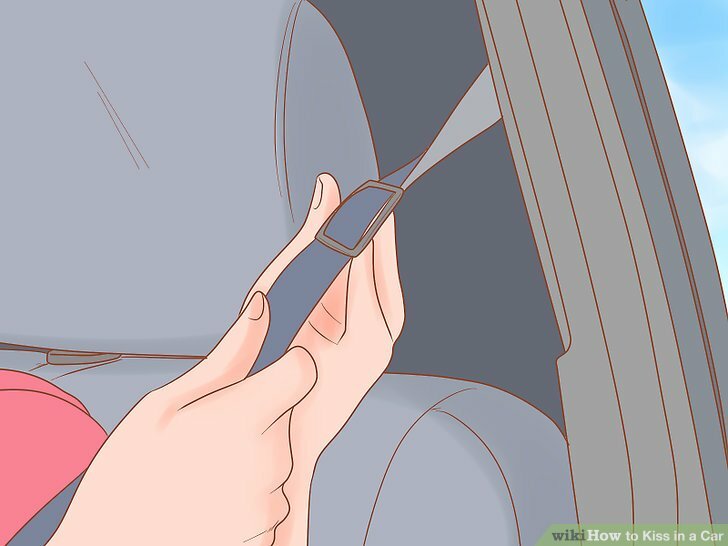 Wipe down the dashboard and door handles by the passenger seat, and remove any trash or clutter that might be sitting in compartments in the side door. 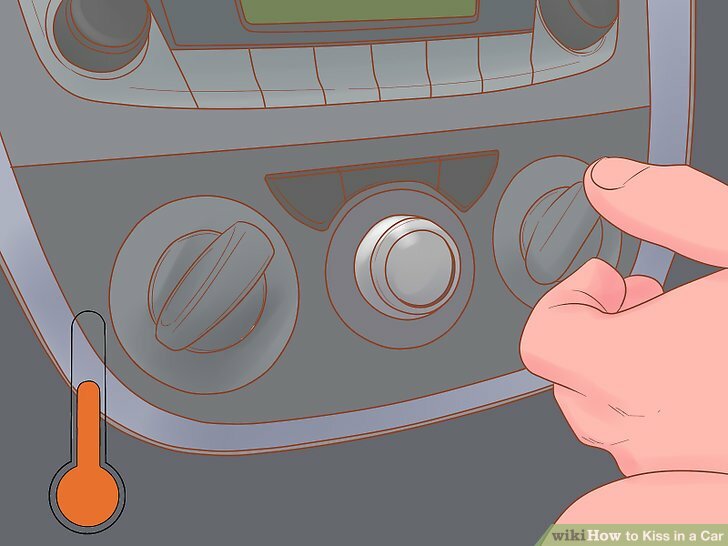 Adjust the temperature of your car to make sure your partner is comfortable. Try to pay attention to whether they seem like they’re too hot or too cold. If you’re not sure, just ask! Remember not to run your battery down if you plan to be there for a while. If you want to cool down the car, ask your partner whether they prefer the windows or air conditioning, as some people might prefer fresh air, while others might not like too much wind from outside. Put on relaxing music to set the mood. Playing fun, lighthearted, or ***y music can help your partner feel more comfortable and can make any silences less awkward. If you happen to know your partner’s favorite band or genre, put that on to help them feel even more relaxed. Find a scenic or secluded place to park the car. Drive to your favorite nearby spot, or suggest your partner take you to a place with a view. At the very least, find somewhere that’s slightly hidden. If you live in an area that's not too flat, try to find a hill or other spot with a scenic overlook. 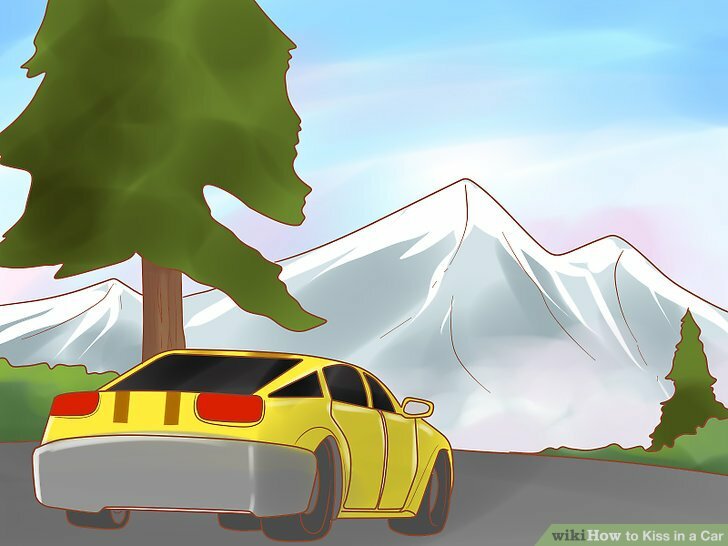 You could also try driving to a nearby park and finding a place that's a bit more hidden by trees. Don’t park under a streetlamp, or in your partner’s brightly-lit driveway where parents might see. Make sure you’re allowed to be parked in your spot. For example, a lot of parks close at sunset and you could get in trouble for trespassing if you park your car there. If you want to really make a good impression, take your car through a car wash before picking up your partner. Turn your car off before starting to kiss someone. If you lose track of time and have a long make-out session, you may end up running down your car battery! Keep some gum in your car for yourself or to offer your partner, in case either of you is worried about bad breath. You have less room to move around in a car, which can sometimes make kissing awkward. Consider opening your partner’s car door for them or walking your partner to the door of their house if you’d rather share a kiss while directly facing each other. Ekta, kiss and tell ? Mika getting ready to kiss Rakhi once again!